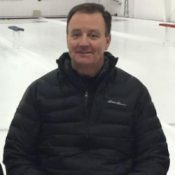 James Anseeuw of Oak Bluff, Manitoba, first began competing in wheelchair curling when he was recruited by Dennis Thiessen in 2014 to play for Team Manitoba. Jamie says wheelchair curling is a great outlet for his competitive side, and has quicky risen in wheelchair curling ranks in Canada. Now a two-time National Champion with Team Manitoba (2014 and 2017), Jamie has been playing with Team Canada for one year. In 2017, he was named Team Canada’s alternate for the PyeongChang Paralympic Games. Jamie will make his Paralympic debut on March 10, 2018. In addition to wheelchair curling, Jamie loves snowmobiling, and mentors snowmobile racers who stand atop X-Games and World Championship podiums. Jamie enjoys the great people in Manitoba, and dreams of winning a Paralympic Gold medal. Jamie won Bronze with Team Canada in wheelchair curling at the 2018 Paralympic Games.